RL (real life) access nodes are physical locations where audiences watch a projection of the 080808 shows and participate via computers at the venue (if there is a wireless network, you may be able to bring your own laptop). Read about the 080808 nodes here. New Dowse Gallery, Wellington, New Zealand. 2-4.30pm. SCHAUMBAD – Freies Atelierhaus Graz, Austria; 7-11pm. SCHAUMBAD is a self-organized studio- and art space, containing 24 individual studios, plus approximately 1500 m2 space for concerts, exhibitions, workshops, talks. MAD @ Smalle Haven Eindhoven, Netherlands, 3-9pm. MAD emergent art center is presenting the Upstage 090909 festival of live online performances. 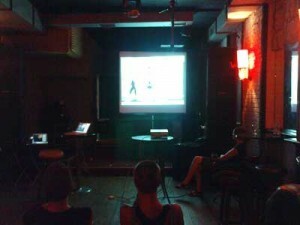 Shown as a live screening of scheduled performances, participation is encouraged through a public computer and peoples laptops. Bring your Avatar! Culture Centre Pancevo, Serbia. 9am-9pm. Beyond the basics, what’s involved in hosting a node is up to the hosts. 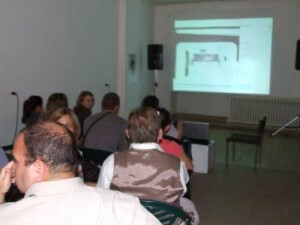 Some nodes have performances that will be presented from the node, incorporating the proximal audience as well as the online audience – such as Galerija Elektrika in Pancevo, where “The Dish” was performed from. Some nodes embedded 090909 within an existing programme, such as the Eclectic Tech Carnival in Istanbul (where one of the performers of “Machine Divas” was located). Other nodes happen in arts centres, museums, and event people’s living rooms, when they invite a few friends around to share the 090909 experience together. Each node chooses which hours during the festival they will operate, according to their own locality and situation. We publicise the nodes via this web site and all media releases and emails that are sent out about 090909; nodes can also do their own publicity. We appreciate feedback and documentation from each node such as photos and numbers of audience.